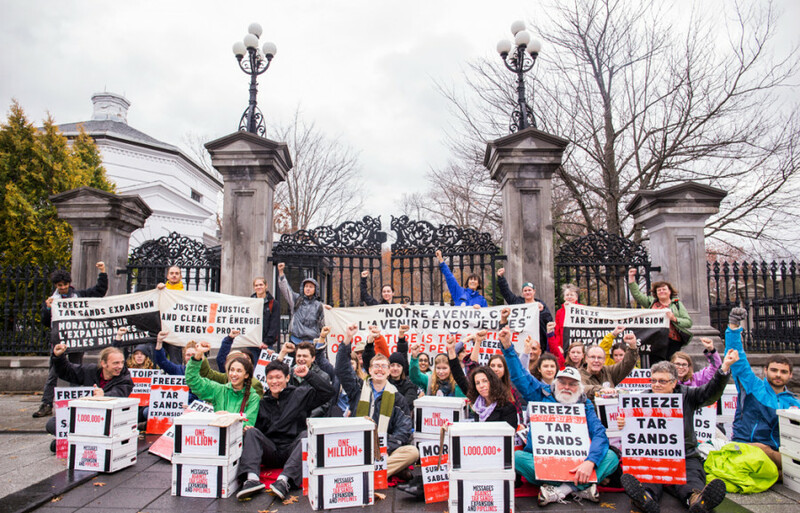 Hundreds of protesters from across Canada assembled at the Prime Minister’s residence in the name of climate justice, from Nov. 5 to 8. The protest, dubbed the Climate Welcome, is motivated by concerns over the Trudeau government’s commitments going into COP21, an international conference in which world leaders will come to a binding and universal agreement on climate policy for the first time. The four days of the action coincided with Trudeau’s first days in office. The action consisted of a combination of sit-ins, phone calls to the Prime Minister’s office and eventually the blockade of a major intersection on Sussex Drive, which connects the Ottawa downtown and Byward Market areas to the neighbourhood of Rockland. 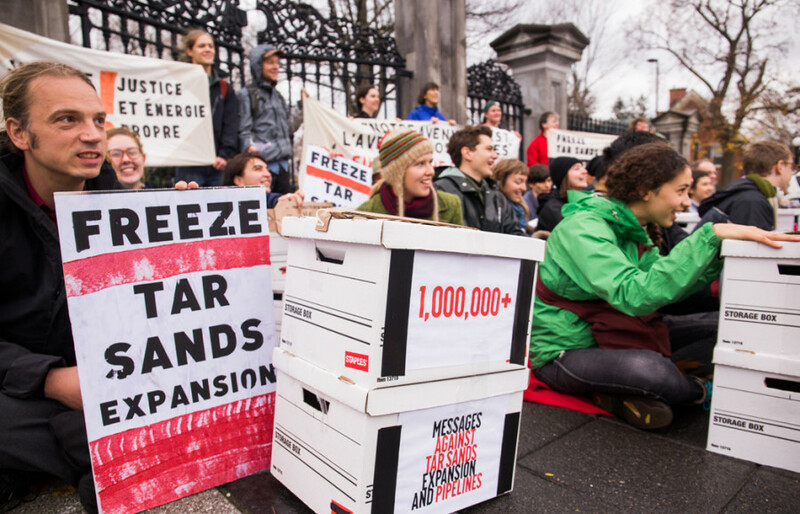 The demands of the Climate Welcome were twofold: that PM Trudeau order a freeze on oil sands expansion in line with his campaign pledges, and that he personally accept a series of gifts delivered by the protestors. The gifts were meant as representations of the scientific support indicating the destruction of climate change as well as to illustrate the serious harm being caused by oil sands operation. Unique to each day, the gifts delivered include a range of reports dealing with various climate issues. These gifts were not accepted by Trudeau himself, but by a communications assistant. The protesters blocked the road when Trudeau repeatedly sent a representative in his place and did not give an answer to the demands of the movement. The blockades held for multiple hours each day and held strong despite police issuing warnings to the activists. No arrests were made during the Climate Welcome due to direct orders made by the Prime Minister’s office. This is coherent with the general media strategy of the Liberal government during the protest: keep a low profile. Not wishing to attract more than a minimum of attention, the government, in conjunction with Ottawa police, did not make any bold moves. Their strategy seems to have worked—though many major Canadian media outlets provided some coverage of the action, there was little mention of the Climate Welcome and its mission. The participants of the Climate Welcome were made aware of this media strategy on the second day of the protest but continued to show up and blockade Sussex Drive. Many were agitated, but the organizers of the event elected not to escalate the protests, as many of the activists had been given training and legal information for the context of a sit-in, but not for other action that could be deemed criminal. There were also concerns over safety and deportation, as the crowd had a large portion of elderly people, as well as non-citizens of Canada, on work or study visas. The Climate Welcome also had its own media image to consider. With the Liberal government being treated so favourably by mainstream news outlets and the important, time-sensitive nature of Canada’s COP21 policy, the organizers were not willing to risk the movement being portrayed as unreasonable or belligerent by the media. The Climate Welcome delivered their largest and perhaps most important gift on the eighth of November—five solar panels to be donated to the Prime Minister with the intention that they be installed on the roof of 24 Sussex Dr. The symbolism of the gift is clear. The Climate Welcome demanded that Canada make real improvement to its climate policy at COP21 and transition away from its dependence on fossil fuels toward renewable energy. The donation of the solar panels was intended as a solutions-based opposition to oil sands expansion, as a gesture from the people to their government that they are ready for the era of sustainable energy. On the final day of the protest, the Prime Minister’s office refused to accept this gift.